The peace statue, some 30 ft tall, depicts an angel of peace, holding an orb and an olive branch. It is in fact a memorial to Edward VII, ‘The Peacemaker’, who convalesced several times in Brighton and restored some of the town’s fashionable reputation. It was designed by Newbury Trent and bears the arms of both Brighton and Hove boroughs. The statue was unveiled by the Duke of Norfolk in October 1912, on the same day as a new home for the Queen’s Nurses was opened. For a year before the erection of the statue proper, a wooden model of it stood in its place. The site of the statue itself is actually in Brighton, but the responsibility of maintaining it is Hove’s. Thank you very much for this great web page – it helped me loads with my geography homework! 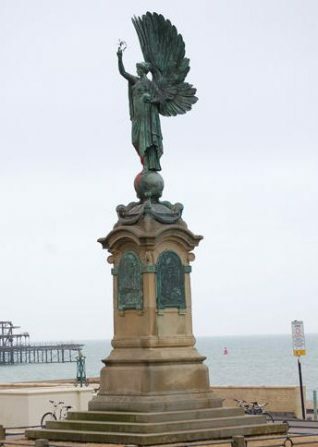 As a boy growing up in Brighton in the 1950s, I was given to believe that the Peace Statue was sometimes referred to by Brightonians as the Boundary Statue as it sits on the boundary of Brighton and Hove. (Oops, sorry, Brighton and Hove are now one city!) I would welcome any comments on this as my curiousity has been awakened. Thank you. I now know lots about the peace statue for my school project. Thanks for the information about the statue. I took a photo of it while staying in Brighton a couple of years ago (I live in Australia) with Brighton pier in the background, but didn’t know what the statue represented until now. My memories of the peace statue were most vivid on November the fifth during the 60’s. Crowds would gather and fireworks (bangers) would be lobbed into the masses. One year we made up a batch of home made bangers with potassium chlorate which is a lot more powerful than the standard [sic] penny bangers of the time. The police would rush forward and step on any thrown banger, however our bangers would almost knock them out when their knees nearly met their chins. From what I can remember, miscreants were bundled into water works vans and dumped at the Devils Dyke and left to walk home, however this needs some verification! James.